I wanted to recreate the same beautiful effect but this time in a savory recipe and using more colors. 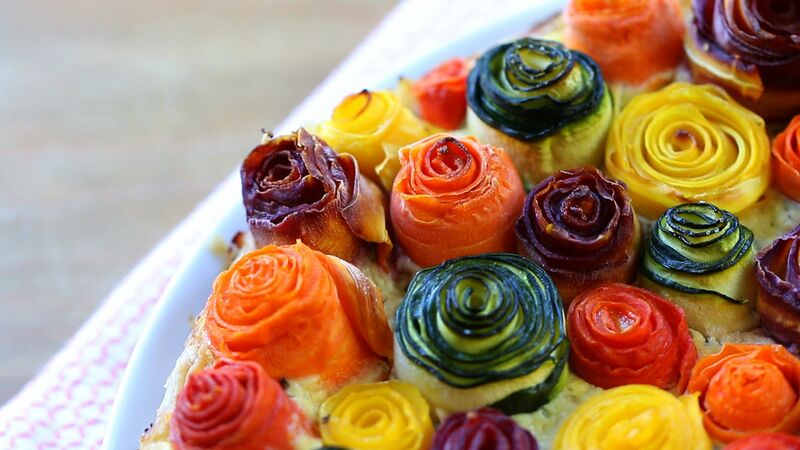 That’ how the zucchini and carrots tart came to life. 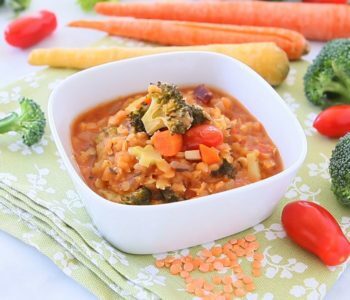 The variety of natural colors of the zucchini and carrots itself was a wonderful combination. As a base for the tart a store bought puff pastry worked perfectly. 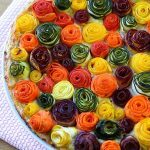 A nice mix of ricotta, mozzarella and parmesan cheese held together by some eggs gave a creamy and salty ground for the vegetable roses. We start preparing the base and unfolding a puff pastry sheet on a tart pan (cover all the surface). Place a parchment paper foil in the center and place on top of it some kind of weight: seeds, dry beans, what you have available in the pantry. I have a box with some dried chickpeas that I keep using and using again as a weight for my tarts 🙂 I really don’t know how many times they have been in the oven…and they still do their job properly!! Bake the tart base in the preheated oven at 350F/180C for 15/20 minutes. Than remove the seeds/dry beans and the parchment paper. Let it cool down. As mentioned before, don’t trow away the seeds/beans…simply keep them in a container for next time! 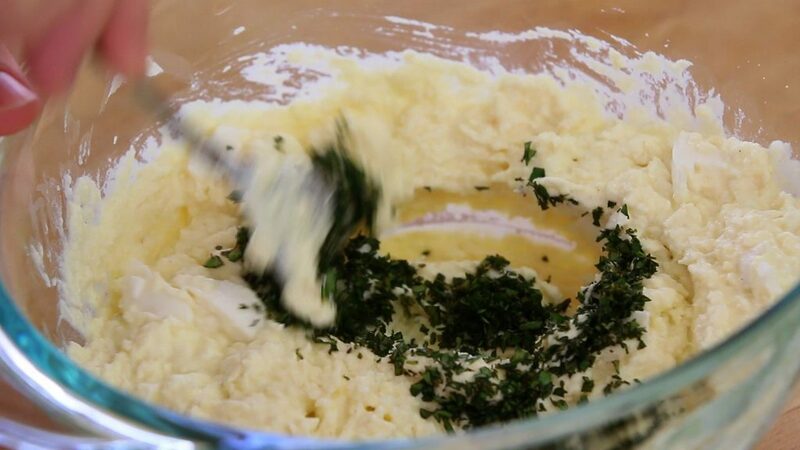 In a medium bowl add the eggs, the ricotta cheese, the grated parmesan cheese and the grated nutmeg. Adjust with a pinch of salt. Also add the mozzarella in cubes and the fresh oregano. Mix everything up until smooth. Now starts the art part of the recipe: creating the roses! 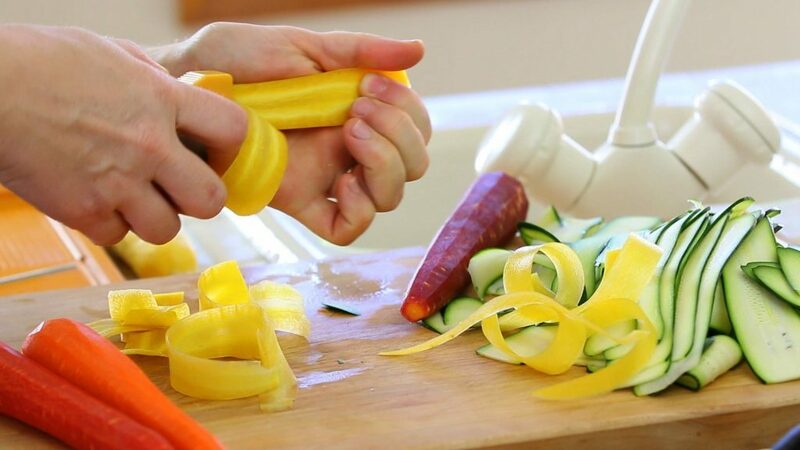 Slice the zucchini and the carrots for their length using a potato peeler or a mandolin. Place the slices in a bowl and cook in the microwave for 1 minute. This step will make the slices very soft and much easier to roll: they will not break while rolling. 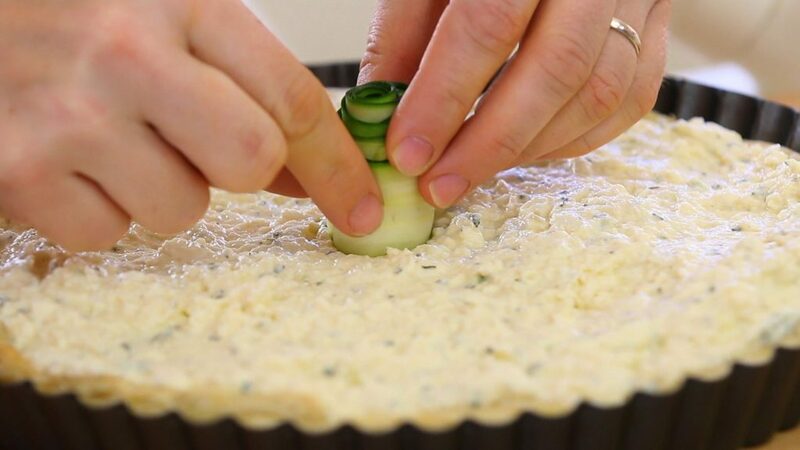 Spread the cheese cream on top of the tart base. 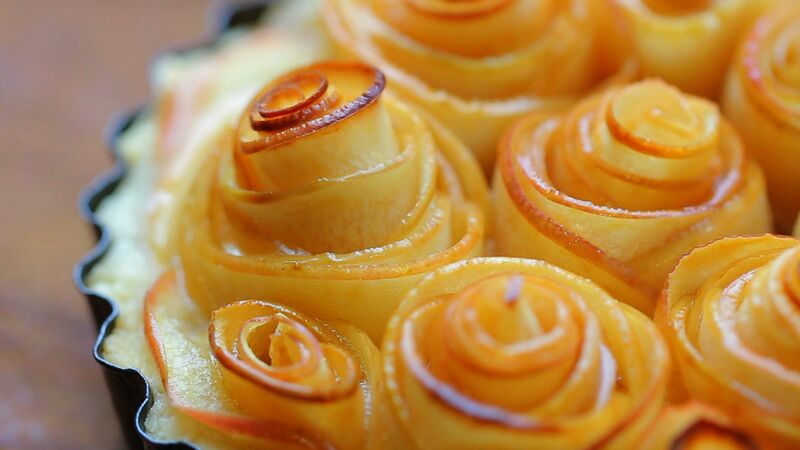 This will not only give extra flavor to the tart, but it will serve as sticky base for the roses to attach. 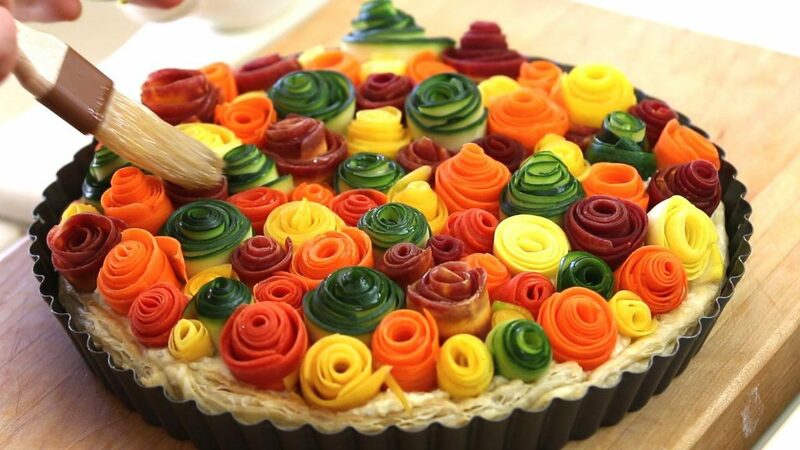 It is basically our way to glue the roses to the pastry base. 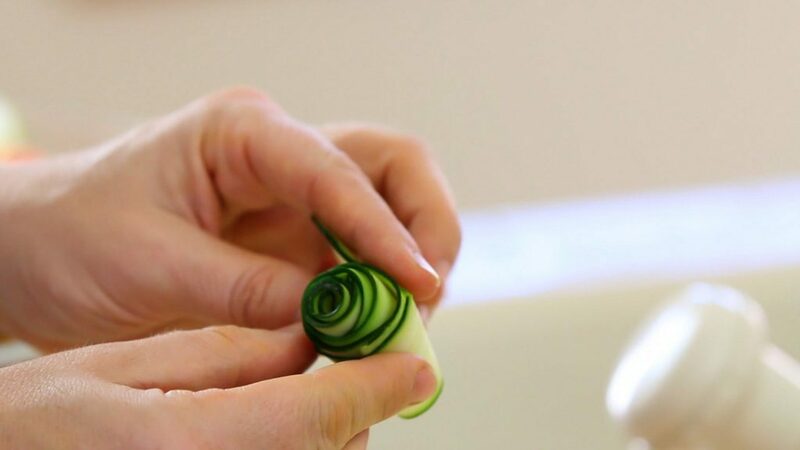 Take one long slice of a vegetable (I started with the zucchini) and roll it on itself very tightly. That’s the core of our rose. Take another slice and keep rolling. With only 2/3 slices you should obtain a nice rose bud. 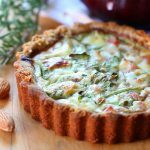 Brush some extra virgin oil of olive on top of the vegetables and bake the tart in the preheated oven at 380F/200C for 50 minutes. p.s. 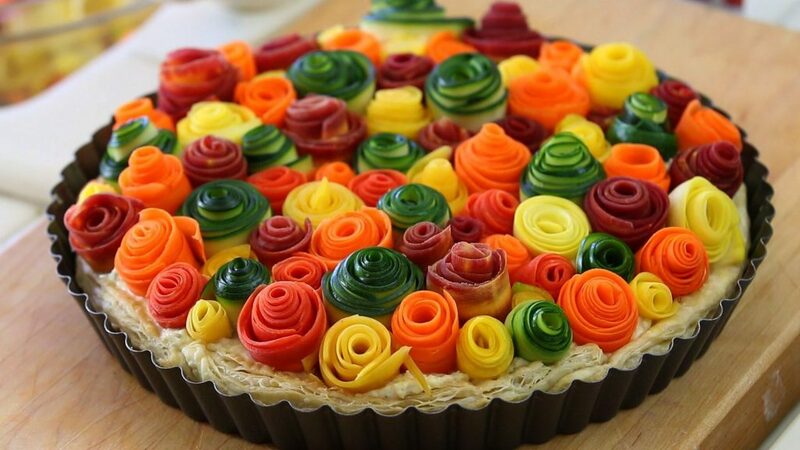 In order to obtain a very colored tart I used purple, orange, yellow and red carrots and yellow and green zucchini in a ratio of 4 carrots for 2 zucchini. The sweetness of the carrots was a nice background for the tart. 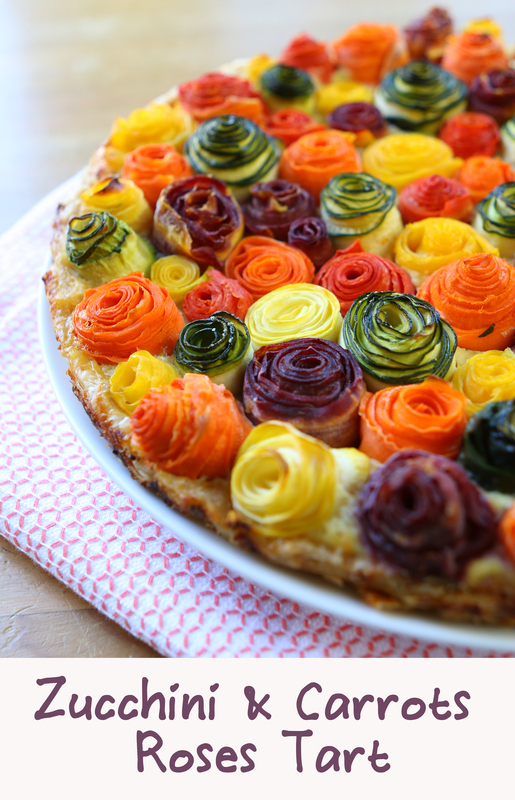 If you want a more savory tart, just change the ratio to 1:1 or even less carrots than zucchini. ricotta cheese 0.8 lb. 350gr. 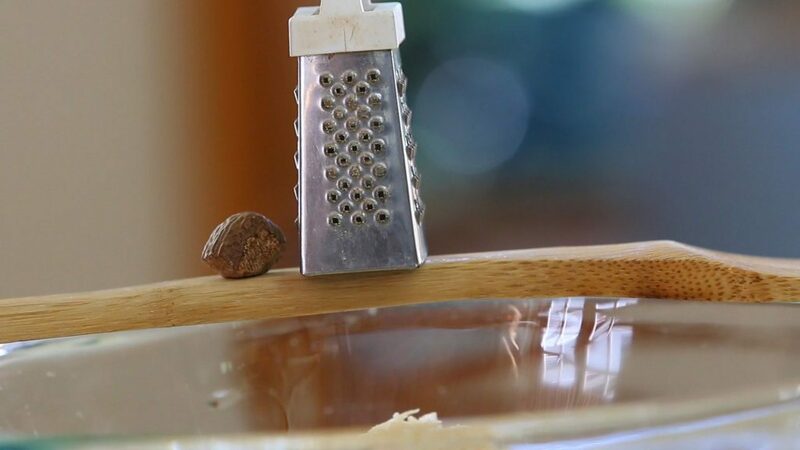 Parmesan cheese 3 oz. 80gr. mozzarella cheese 4.5 oz. 130gr. 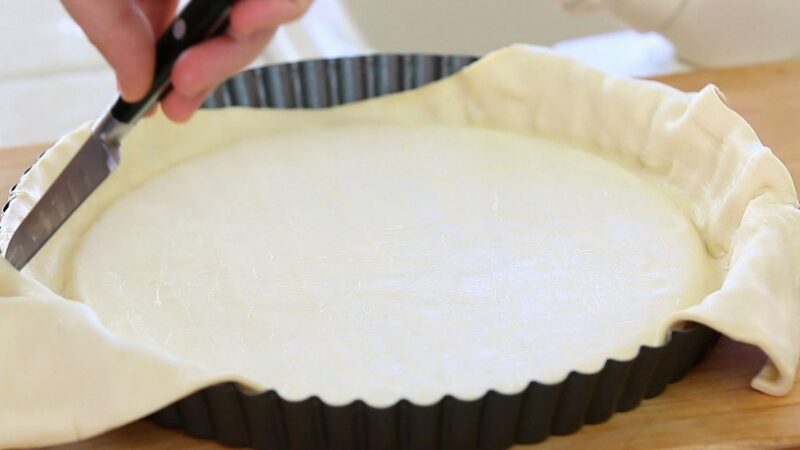 Tart base: unfold a puff pastry sheet on a tart pan (cover all the surface). Place a parchment paper foil in the center and place on top of it some kind of weight (seeds, dry beans). Bake the tart base in the preheated oven at 350F/180C for 15/20 minutes. Remove the seeds/dry beans and the parchment paper. Let it cool down. 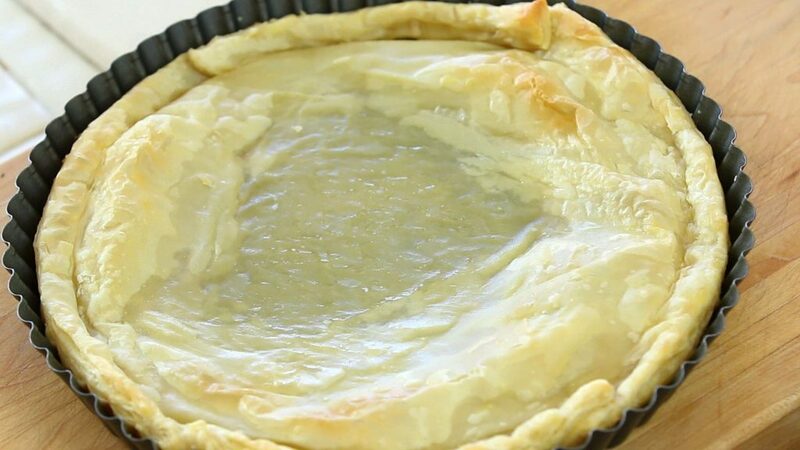 Tart filling: in a medium bowl add the eggs, the ricotta cheese, the grated parmesan cheese and the grated nutmeg. Adjust with a pinch of salt. Also add the mozzarella in cubes and the fresh oregano. Mix everything up until smooth. 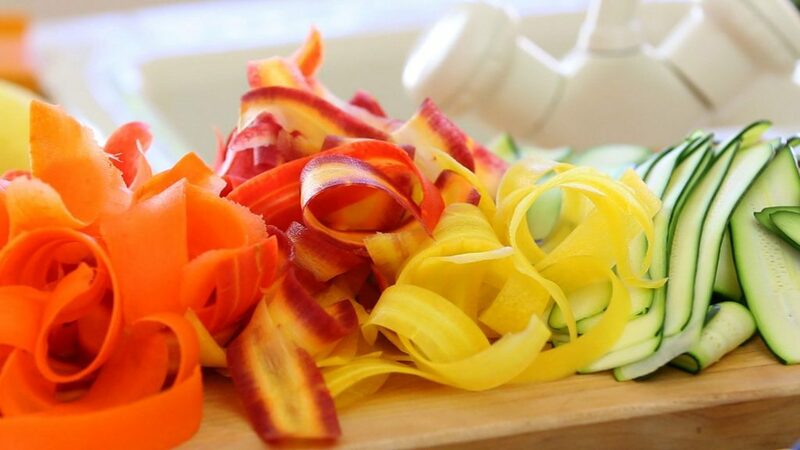 Roses: slice the zucchini and the carrots for their length using a potato peeler or a mandolin. Place the slices in a bowl and cook in the microwave for 1 minute. 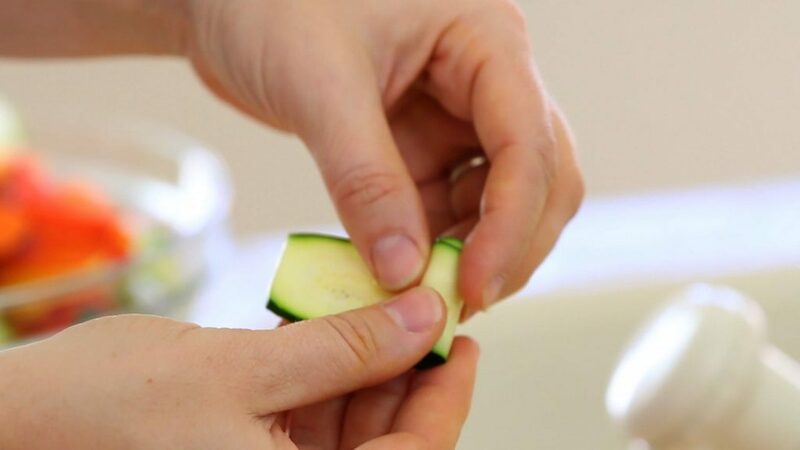 This step will make the slices very soft and much easier to roll: they will not break while rolling. Stunning! What a creative idea. 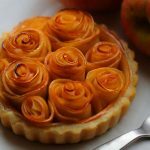 Do the roses fall apart when you slice the tart? I’m definitely going to attempt this for our next family gathering! What a beautiful, stunning, simple dish to enhance any table and special occasion. thank you very much…. (from an 82 yr. old grandmother who recently began to appreciate easy but gorgeous recipes). Does it have to be served warm? I was thinking of taking to a picnic, but it sounds like warm might be better? Hi Gill! thank you for your comment! 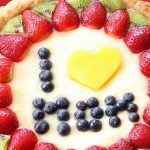 Thank you for sharing this beautiful and delicious recipe with the world! I made this and gave it as a gift to my significant other for dinner and they loved it! Can’t wait to make it again! This looks incredible! 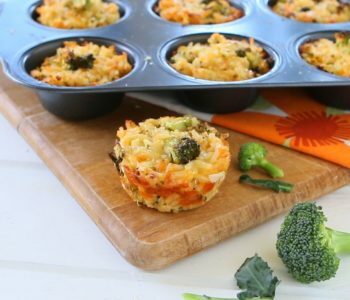 Do you think I could use a muffin pan and make individual servings, probably with slightly larger roses to avoid having to cut it into pieces or do you foresee any issues with that? Thanks! I think this is about to become a tradition in our house! 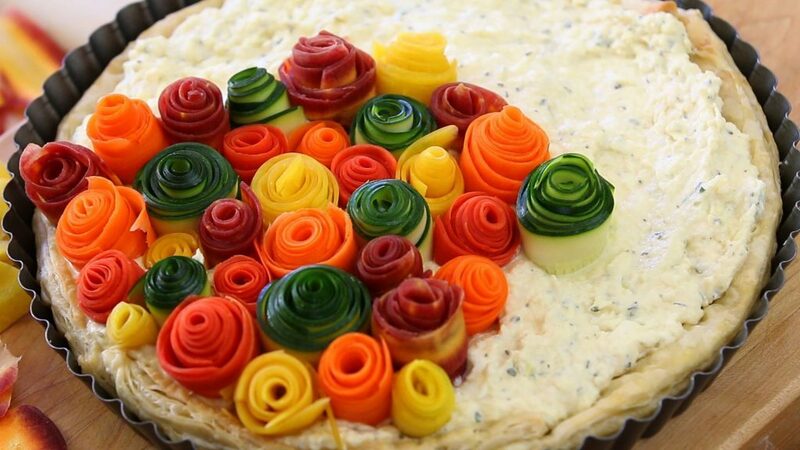 My mother-in-law is now planning to make this for our Thanksgiving celebration. My daughter is named Sophia Rose and of course, we love roses. 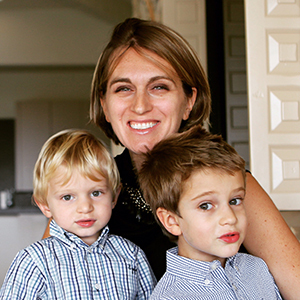 Thank you for creating something beautiful, delicious, and healthy. Sure!As I’m cooking for kids I always try to avoid pepper and reduce salt in my recipes 😉 If your family likes the trio garlic/salt/pepper it will be a very nice addition to the recipe. Enjoy! Made this today subbing out a gluten free pie crust for the puff pastry to accommodate guests. It was delicious and simple (even tho slicing and rolling vegetables took a bit of time). I will definitely made this again! It was beautiful too! Bardzo ciekawy i smaczny pomysł. Wielkie wyrazy uznania za kreatywne pomysły. znam też Twój przepis na ciastoz różami z jabłek, Super Gratulacje podziękowania i pozdrowienia z Polski. Thank you for sharing this beautiful dish! Do you have any idea how I can convert it into a vegan recipe ? Can’t wait to try to but I wish you would use the guard on the mandolin , they are so sharp. How do we print this out? 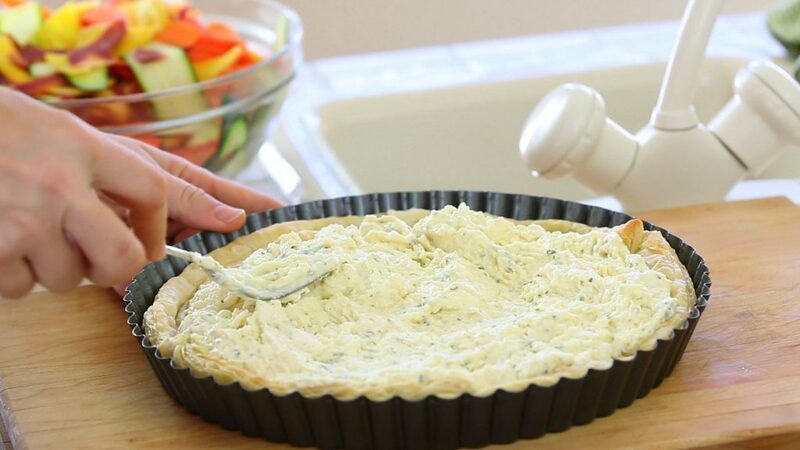 I want to make two of these but only have one tart pan, can I make it in a pie plate? 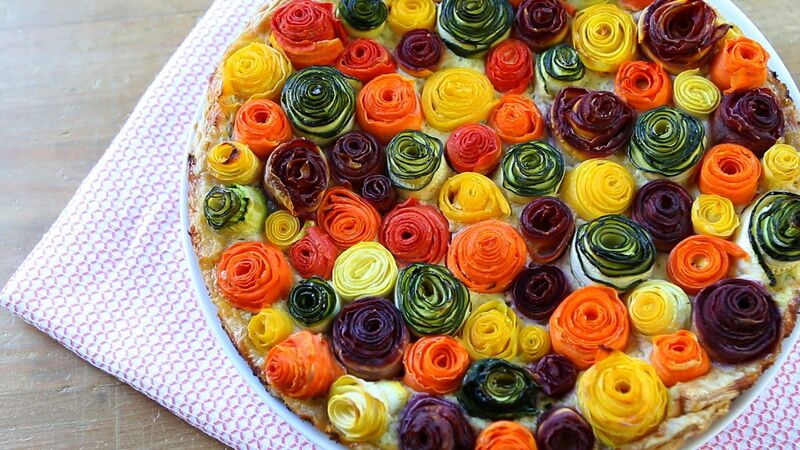 I want to make this beautiful tart for my daughter’s baby shower. I don’t have a microwave. How should I soften the veggies for rolling? 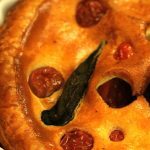 Boiling/steaming for a few minutes? Hi! Do you think I could assemble the night before and cook for a 1:00 luncheon? Or would you recommend cooking the night before and serving cold? sure, that’s the best way. Prepare the tart the day before (even in the morning) but do not bake it. Store it in the refrigerator with a plastic wrap on top to keep the moisture in. 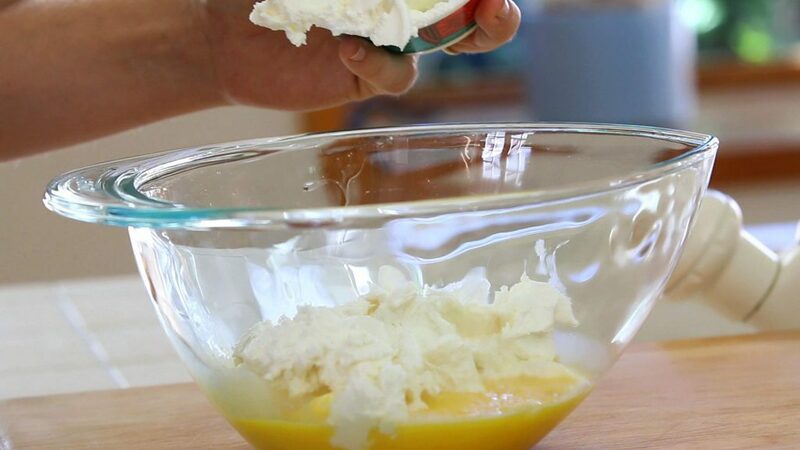 Remove it from the refrigerator 30 min before baking it and than bake it following the recipe. Enjoy!!! 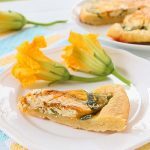 Do you think sweet potato or butternut squash would work in this tart if properly cut to size? I love the different colors, but don’t know if I’ll be able to find multicolored carrots. Thanks! All excited…I found that Trader Joe’s carries bags of mixed colors carrots. They have in eachbbag a few of each color…orange, yellow/white, and purple. I love your recipe. It came out fabulous ! One thing I would like to pass on… the purple carrots leaked purple color into the others because I tried doing all my slices at once on a big plate in the microwave…the purple color soaked into the orange, making them brown, but, the white carrots picked up the purple and turned a beautiful color pink. So I could put the pink and purple together for an awesome color grouping. Thanks so much for a great recipe ! Wonder if subbing out some of the carrots for Japanese Eggplant would work? I made this last weekend for a morning baptism (since the meal would be around brunch time). It was a total hit! Couldn’t find purple carrots, which I’m sure would’ve added some extra pop of color, but compliments from everyone. There was nothing left! Hi Barbara. I’m hoping to use this for my daughter’s bunny-themed birthday party. Do you think this could work on top of pre-made pizza crusts, or would everything bleed off the edges? Thanks! 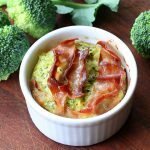 Hello and thank you for this beautiful recipe! I was wondering if it would be OK to bake the tart in the early morning and then serve it at night. I have a party after work but don’t have enough time to bake after work before. If I bake it in the morning, should I store in the fridge after baking? Many thanks! 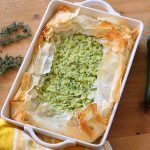 Torta de legumes do Pinterest - Fala, mãe! Hi! 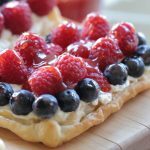 I was thinking about making this tart with a homemade shortcrust pastry. How do you think I should do with the baking? Should I still bake it a bit alone with beans and again with the vegetables on top or just with the vegetables? 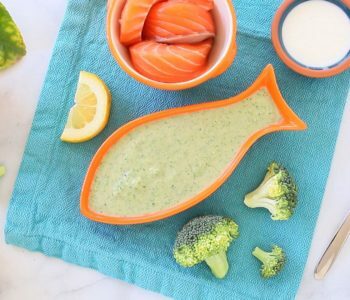 I just recently found this recipe and I plan to make it with a birthday celebration 🙂 Do you have any recommendations for what would be nice to serve it with – a specific salad perhaps? Also, what would go nice as a started before this? How far in advance can you prepare the tart and then cook it? Do you think I could make this the night before, keep in the fridge and cook the next morning? I want to preparethe tarte for a party tomorrow but I don’t have a microvawe to soften up the veggies. Is there any other way that I could do it? Oven maybe? Or can i just skip this step… or does it make it impossible to rell them up? Thank you for your answer Barbara! It worked out very well with cooking the veggies! I want to prepare the tarte for a party tomorrow but I don’t have a microvawe to soften up the veggies. Is there any other way that I could do it? Oven maybe? Or can i just skip this step… or does it make it impossible to roll them up then? beautiful tart. i am planning to make one for a dinner we have coming up, and i was just wondering, do you know whether it would freeze and warm up ok? 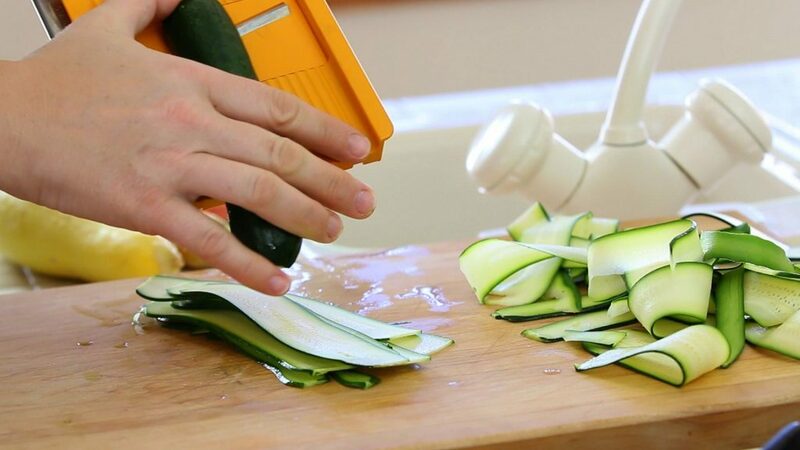 or would the veggies go watery? Would I be able to use beetroot as well or will that not work? 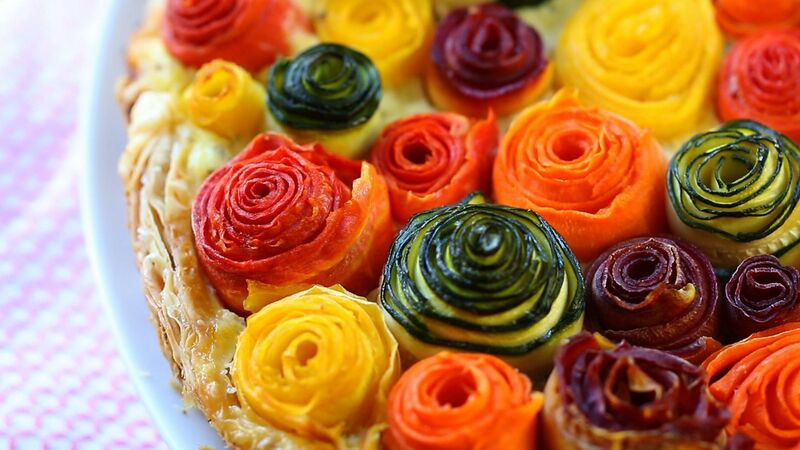 If I’m on a special lean protein & veggie diet & cannot eat puff pastry or dairy, is there a way to eat these roses without the tart? Do you have any suggestions? Thank you!! Did not read what size tart pan to use. Looks like maybe 9 or 12″?